1) On February 15, at 7pm, Aura at The Seaport Hotel will host a wine dinner with Bonny Doon Vineyard as part of the 23rd annual Boston Wine Expo, one of the country’s biggest and most respected celebrations of wine, food and culture. This California-based vineyard produces premium wines from both domestic and old world vineyards with distinctive yet expressive flavors. Aura will team up with Bonny Doon’s chief winemaker, Randall Grahm, to host a four-course dinner featuring signature cuisine paired with Randall’s selections from the Bonny Doon winery. Reservation required by calling Aura at 617-385-4300. 2) On Saturday, February 1, from 10am-2pm, the Wayland Winter Farmers' Market will hold their 4th annual Massachusetts Farm Wineries Day. Eight farm wineries from throughout the state will be there.There will also be 40 food vendors at the market. I went to last year's event, and it was an excellent event, with plenty of interesting food and wine. Highly recommended. 3) On Thursday, February 6, starting at 7pm, there will be a compelling Sherry Tasting Seminar at Taberna De Haro in Brookline. The event is titled, Comparing Styles of Emilio Lustau, and each course will offer two different styles of the same wine, all made in the winery of Emilio Lustau, a place blessed with old stocks and progressive talent. I have visited the Lustau winery, and can vouch for the quality and diversity of their Sherry. Chef Deborah Hansen will pair herries like the straightforward Manzanilla Papirusa and the Manzanilla Pasada Cuevas Jurado so you can contrast the fresh, bristling notes of the first with the mellower, nuttier aspects of the second. The Fino course will consist of a Fino from el Puerto de Santa Maria, something rather scarce in this market, next to a Fino en Rama (unfiltered) from the same little town - something scarcer still. The Amontillado Los Arcos will be juxtaposed with the Rare Amontillado Almacenista Escuadrilla, illustrating the effect of the long, careful aging. Oloroso Don Nuño will be tasted with the Oloroso Emperatriz Eugenia, a supple and regal oloroso that everyone adores. It will finish with the yet-to-be-released Brandy de Jerez Solera Reserva! Coming soon to Massachusetts - be the first to taste it! 4) On Sunday, February 2 and Monday, February 3, the Beacon Hill Hotel & Bistro will serve crepe specials in honor of Le Jour des Crêpes (also known as la Chandaleur), a French holiday honoring the end of the Christmas season. Guests can indulge in a variety of Executive Chef Josh Lewin’s sweet and savory crepes being offered during dinner on Sunday and during breakfast, lunch and dinner on Monday including specials such as jamon mangalica and béchamel, butternut squash and sage, as well as raspberry sauce and spiced pecans. While celebrated differently in many cultures, la Chandaleur always takes place 40 days after Christmas on February 2nd. In France it’s tradition to eat crepes after 8PM, and it is said that if a cook holds a coin in one hand and successfully tosses a crepe with a frying pan in the other, the household will be prosperous throughout the year. Reservations are recommended and can be made by calling 617-723-7575. 5) For Valentine’s Day, consider going to Coppa where chefs Ken Oringer and Jamie Bissonnette have put together a special 3-course tasting menu, priced at $55 per person, and $35 extra for wine pairings. For each course, you will have a choice of five options, and these options can be quite compelling. Would you like to win a free pair of tickets to the Boston Wine Expo? Well, 23 people responded, seeking a chance to win a pair of tickets to the Sunday Grand Tasting (valued at $170) at the Boston Wine Expo, which will be held February 15-16. The Expo will showcase over 185 wineries from all over the world, with over 1000 wines to sample. This is a huge wine event, presenting a unique opportunity to taste a diverse selection of wines and hopefully to find some new favorites. Using RandomOrg, the Winner of the free tickets was determined to be: @Boston_Drinks. Congratulations and you can pick up your tickets at the Expo at the Will Call window with proper ID. And if you did't win the tickets, I can offer you a discount for tickets to the Saturday or Sunday Grand Tastings. Just use the code “SOCIAL” (without quotes) to get 10% off your tickets. If you are attending the Boston Wine Expo, please also check out my advice and suggestions for handling a large scale wine tasting. This past weekend, I attended the Mohegan Sun Wine Fest, another large tasting event, and much of my advice was relevant there as well, from beginning my day with a hearty breakfast to spitting plenty. I will be attending the Boston Wine Expo and hope to see many of you there as well. And I'll even give you a little insight into some of the wines I'll be seeking out at the Expo. First, I will be sure to taste a number of Portuguese wines, and I mean more than just Port. Portugal offers some of the best wine values in the world, and their plethora of indigenous grapes can create some fascinating still wines. I highly recommend you check out the Portugal tables. Second, I always check out the South African tables, as I am a fan of Pinotage and believe some very interesting wines are coming out of that country. What wines will you be seeking out at the Expo? The Boston Wine Expo will be held in about three weeks, February 15-16, and it will showcase over 185 wineries from all over the world, so you'll be able to sample from over 1000 wines. This is a huge wine event, presenting a unique opportunity to taste a diverse selection of wines and hopefully to find some new favorites. I am giving away a pair of tickets to the Sunday Grand Tasting (valued at $170). All you have to do for a chance to win is leave a comment on this post by January 27 at midnight. I will then randomly select one person to win the pair of tickets. Please leave your email address too in your comment so I can contact you if you win. Very simple. And if you don't win the tickets, I can offer you a discount for tickets to the Saturday or Sunday Grand Tastings. Just use the code “SOCIAL” (without quotes) to get 10% off your tickets. In addition, I want to offer some advice and suggestions for everyone who may be attending the Boston Wine Expo as it can seem overwhelming. People go to the Expo for a number of different reasons. Though many don't like to discuss it, there is a contingent that goes just to get drunk. I don't advise to do this. Go, have fun, taste wine, but don't over do it. Use this opportunity to learn about wine, to find new favorites, and to socialize with other wine lovers. What is my best advice for attending the Expo? Like many endeavors, the key is in your preparation. Don't just show up and drink, especially if you want to learn anything. 1) Make a plan of which wine regions and/or specific wineries you want to visit. The Expo website lists many of the participating wineries. You cannot taste every wine, or probably even 10% of those wines, at the Expo. So you need to be very selective as to what you taste. If you don't go with a plan, you may waste time wandering around the hall, and might even miss a winery that you really wanted to check out. With a plan, you can best take advantage of your limited time. 2) Don't drink wines you already know and like. You can do that anytime and anywhere else. Instead, take this opportunity to expand your palate and try different wines, hoping to find new wines to enjoy. Never had Portuguese wines? Then make an effort to venture to their tables and try some of their wines, from Vinho Verde to Altejano reds. With all the diversity of wines available, it makes little sense to spend your time drinking the same wines you drink at home all the time. Be willing to experiment and taste something different. 3) To avoid the greatest crowds, go on Sunday rather than Saturday. Saturday in the Grand Tasting can be madness with the huge hordes of attendees. Sunday though does not attract as large a hordeof wine lovers. It will still be crowded, but is more manageable. 4) Dress comfortably, noting that there is always the potential you might spill wine on your clothes. So leave those white shirts, blouses, pants,etc. home. Wear comfortable shoes as you will be on your feet for several hours, walking around the Expo hall. 5) Don't wear perfume or cologne as they will interfere with your ability to smell the wine, and will also interfere with the ability of other people to do the same. So show consideration for your fellow attendees and don't wear it. 6) Eat a hearty meal before going to the Expo. If you are going to be tasting all that wine, you want to have a full stomach to help nullify some of that alcohol. If you go on an empty stomach, the alcohol will hit you harder and quicker, and you won't last long at the Expo. 7) How will you get to the Expo? Remember that you will be tasting lots of wines so you may not be able to drive home safely. No one should ever drink and drive! So, if you can, take public transportation, book a nearby hotel room, or have a designated driver. Please don't drink and drive. 8) If driving in, leave your coat in your vehicle. It gets warm in the Expo hall and wearing or carrying your coat can be a pain. You can check your coat at the Expo but when the Expo ends, there is often a long line to retrieve coats. To avoid that line, keep your coat in your car. 9) Arrive early to avoid the long lines getting into the Grand Tasting. Though the tasting starts at 1pm, lines may start forming one to two hours beforehand. 10) At the Expo, when you are tasting wines, please spit. Every sip you swallow adds to your alcohol level and if you do not spit, you will soon find yourself intoxicated. Even small sips can add up quickly. Once you are intoxicated, all of the wines will start tasting good to you and you probably won't learn anything. Spitting is the only way to navigate through a large number of wines, trying to discern which new wines appeal to you. So spit, spit, spit! 11) While you are tasting wines, take frequent breaks to drink water and eat snacks to help cleanse your palate. There are numerous food vendors at the Expo, many offering free samples, so there is no excuse why you can't find something to nibble upon. Water is also necessary to stay hydrated. All of this will help keep your palate sharp, and also try to limit the effect of all that alcohol. 12) If you find a new wine you enjoy, how will you remember it? You can take notes, writing down the name of the wine, or use your smart phone to take a picture of the wine bottle label. Nothing is worse than tasting a great wine but later forgetting its name. You will taste plenty of wines at the Expo so the only way to ensure you remember which ones you enjoyed are to take notes or pictures. 13) If you really enjoy a wine, ask questions about whether it is available or not. Unfortunately, not all of the wines poured at the Expo are yet available in Massachusetts. If it is available, they should be able to tell you the name of the distributor. Write that info down as it will help you locate the wine later. You can go to your local wine store with that info and they should be able to get the wine for you. 14) Consider attending one of the Wine Seminars at the Expo. They can be an excellent way for more directed wine education, in a more intimate forum. Check out seminars such as New Emerging Regions of Spain, Oregon Cool Whites, Scotch 101, Cheese & Wine Matching, Exciting Argentina, and Rum 101. 15) Check out the Chef Demos, which take place on two different stages. Each day of the Expo, there are eight chefs, mostly local ones, who will demo a recipe, which you also will get to sample. Go see Ming Tsai, Brian Poe, Chris Coombs, Mary Ann Esposito and others. 1) Join SKY, located in Norwood, on Friday, January 31, for a special Whiskey Dinner featuring five whiskeys; each accompanied by a complementing regional dish. The evening begins at 7pm with a reception and a multi-course dinner, prepared by Executive Chef Andy DiPace, then begins at 7:30pm. Whistlepig Rye (Vermont)--Notes of cinnamon and cherry, toasted rye on the palate with hints of dark chocolate. Blanton’s Bourbon (Kentucky)--Deep nose of citrus and oak, hints of honey, creamy vanilla finish. 2) Chef Tony Maws and Chef de Cuisine Carl Dooley have created the most adventurous and delicious menu for the third annual Road Less Travelled dinner at Craigie On Main. The five-course dinner will take diners on a food-forward adventure January 29. This feast is not an exercise in being as wild or outrageous as possible. On the contrary, the Craigie team is aiming to demonstrate how truly excellent lesser-known parts of animals, fish, vegetables and little known herbs and spices are. “I love cooking,” says Chef Maws. “A dinner like this is the ultimate experience for our team to showcase our creativity in cooking; strengthen our commitment to minimizing waste, and to expose our guests to unique flavors and ingredients they may have not been able to try before.” Of course this isn’t just about the food. Weird wine pairings and interesting beer and cocktails will be poured to complete the experience. Desserts – we have to leave some surprises! 1. Guests will have to Google at least 10 things on the menu to identify/pronounce them. If you don’t, Craigie will give you an order of the famous Crispy Fried Pig Tails on your next visit. 2. If guests don’t agree that these lesser-known selections are every bit as delicious as their more popular cousins, they can enjoy an order of the pig part du jour. 3) Get ready for the 1st Annual Portsmouth Fire + Ice Festival from Thursday evening, February 13 through Monday, February 17. The Fire + Ice Festival celebrates Valentine's Day, Presidents Day Weekend and Winter in Portsmouth, with festivities coordinated by members of the Greater Portsmouth Chamber of Commerce. Building on the Ice Fest that the Portsmouth Gas Light Company restaurant has held on weekend evenings in mid-February for the last three years, the new city-wide Festival incorporates day-time fun for families, special programs and offers in stores, restaurants and performing arts spaces and evening entertainment. --The Port Inn Opening Night Party. Time TBA. Port Inn debuts its renovated lobby and guestroom designs at the kick-off party, serving Fire + Ice cocktails featuring New Amsterdam vodka and appetizers for guests and a fire pit and ice sculptures for outside decor. --The Music Hall 7pm HD Broadcast: Romeo and Juliet starting Orlando Bloom. $22. --Portsmouth Gas Light Company Fire + Ice Fest Charity Night. Begins at 6pm with all proceeds from the door and raffle tickets to benefit Pro Portsmouth, Strawbery Banke and Seacoast Repertory Theater. There will be three ice bars, fire pits, ice luges, wood fire grilled food and ice sculptures. Beverages are sponsored by Southern Wine and Spirits and New Hampshire Distributors. --NHPTV Presents Winter films at the Seacoast Repertory Theater. Throughout the day, the Rep will be playing winter themed shows and short films from NHPTV. This event is free to the public. --Portsmouth Gas Light Company Fire + Ice Fest. Beginning at 6pm, there will be three ice bars, fire pits, ice luges, wood fire-grilled food and ice sculptures. Beverages are sponsored by Southern Wine and Spirits and New Hampshire Distributors. --Winter Night at Pitt Tavern, 7-10pm at Strawbery Banke Museum celebrates President’s Day Weekend in a manner George Washington would have recognized when he visited the Tavern in 1789. Live acoustic music, beer specially brewed for Strawbery Banke by the Portsmouth Brewing Company and tavern food prepared by The White Apron Café at Strawbery Banke. $22.50 per person. --Dog Sled Rides at Strawbery Banke from 10am-4pm. Seal Cove Dog Sledding will be providing dog sled rides to the public on Puddle Dock at Strawbery Banke. Free demonstration of miniature portrait painting, recreating the traditional oil-on-copper style popular in the eras of Presidents Washington and Lincoln, presented by Strawbery Banke artist-in-residence Alan Ammann in the Tyco Visitors Center. --Performances by Patrick Dorow Productions at the Player’s Ring from 12-6pm. The Player’s Ring will also be providing warm beverages for anyone enjoying the festival who need to warm up! This is a free event to the public. --Portsmouth Gas Light Company Fire + Ice Fest. Beginning at 12pm, there will be three ice bars, fire pits, ice luges, wood fire grilled food and ice sculptures. Beverages are sponsored by Southern Wine and Spirits and New Hampshire Distributors. --Fire and Ice Themed Pecha Kucha. Doors open at 6pm and presentations will begin at 7pm at the Portsmouth Gas Light Company in the Third Floor Night Club. During a Pecha Kucha night, presenters are asked to bring 20 slides related to the night’s theme but are only given 20 seconds to explain each one. The Gas Light will have the bar open and a limited menu available to guests. 6) Prezza is about to be struck by Cupid’s arrow with the arrival of San Valentino in the North End. On Valentine’s Day, Executive Chef & Owner Anthony Caturano will dish out four exclusive specials for one night only. To start, there is a Nantucket Bay Scallop Crudo (Meyer lemon, chili flakes, basil, fennel - $16). For a handmade pasta course, Prezza will serve up Ricotta Gnocchi (lobster, Amaro cream, sage, crushed hazelnuts, bacon - $20 as appetizer; $36 as entree). For entrees, there is a Red Snapper Milanese (mixed radishes, cucumbers, watercress & tarragon vinaigrette - $32) and Grilled Rack of Lamb (roasted potatoes, Brussels sprouts, fine herb aioli - $46). 7) Kitchen Kibitz, the new participatory dining experience which explores modern Jewish cuisine with rich global influences, has teamed up with Shōjō Asian Bar & Bistro to celebrate Asian New Year with a twist. Together, Kitchen Kibitz and the team at Shōjō will be hosting a special Asian New Year dinner on Sunday, January 26. The dinner will feature two seatings, one at 6PM and one at 8PM. Tickets for the dinner are $68 per person, include eight courses and cocktails, and can be purchased through Eventbrite. Special guest chef Mark O’Leary, O Ya and jm curley alum, will be joining Shōjō chef Jeremy Lee to collaborate on the menu and present the dinner. The dinner will take place at Shōjō at 9A Tyler Street in Chinatown. "We always hope to tell a story through the dinners we host, and Shōjō does a tremendous job at telling their story of Asian cuisine" Gabel said "Since we come from similar backgrounds of re-imagining traditional food, we knew it would be a terrific partnership." Asian New Year is a major holiday for much of the Boston community and the dinner will pay homage to traditional fare with symbolic meanings and will also share influence of Jewish cuisine. Asian and Jewish culture and cuisine share a surprising amount of similarities, and these are particularly evident when it comes to holidays and the ways families and groups share these traditional meals. The cuisines marry well, and Kitchen Kibitz and Shōjō, who both use fun, untraditional ways to make diners fall in love with meals made with traditional aspects, combine their passions easily to create a truly different dining experience. 8) This Valentine’s Day weekend, from Friday, February 14 to Sunday, February 16, from 5pm-1am, Executive Chef Eric Gburski is spicing things up in the South End with a spread of seafood specials at Estelle’s Southern Cuisine. In addition to serving their regular menu, Estelle’s will make Valentine’s Day a little hotter – and spicier – by dishing out seven dishes with intoxicating southern flavors. For starters, there is Cotuit Bay Oysters 2 Ways (half dozen on the ½ shell with pickled watermelon rind & jalapeño mignonette - $15.95; or, four oysters baked on the ½ shell with lump crab, cornbread crumbs & Cajun butter - $15.95), #1 Raw Tuna Tartare (creole mustard, pomegranate, arugula, sherry vinegar & fresh corn nuts - $13.95) and Grilled R.I. Littleneck Clams (scotch bonnet sausage, black eye peas, charred tomatoes, wine & butter - $12.95). There are a trio of entrée options: Pepper Grilled Yellowfin Tuna (mustard-chile-soy sauce, fried sweet potatoes & grilled broccoli rabe - $26.95); Grilled Jumbo Gulf White Shrimp (creole lump crab relish, andouille sausage braised black eye peas & buttermilk fried onions - $28.95); and, Blackened Bacon Wrapped Scallops (tomato-chile-chutney, creamy-cheddar grits & garlic seared spinach - $27.95). To conclude this southern culinary adventure, dive into the Molten Chocolate-Chile Cake (raspberry-champagne sauce - $8.95). Eat Ink: Recipes. Stories. Ink. "I always thought tattoos were part of history, a part of culture and ritual." Ink. Skin Art. Tats. The history of tattooing extends back many thousands of years, and cultures all across the world have engaged in this practice. In Massachusetts, tattooing was banned back in 1962 and that law was finally overturned in 2000. During that period of prohibition, people of Massachusetts who wanted a tattoo had to travel to another state to acquire their ink, or get it illegally within the state from an underground tattoo artist. Since tattooing became legal in 2000, many more people have acquired skin art, and it has become very common in the food industry. A number of chefs, cook, servers and other food industry workers have gotten tattoos that reflect their culinary interests and passions. A fascinating new book, which I received as a review sample, celebrates this intersection of food and tattoos. 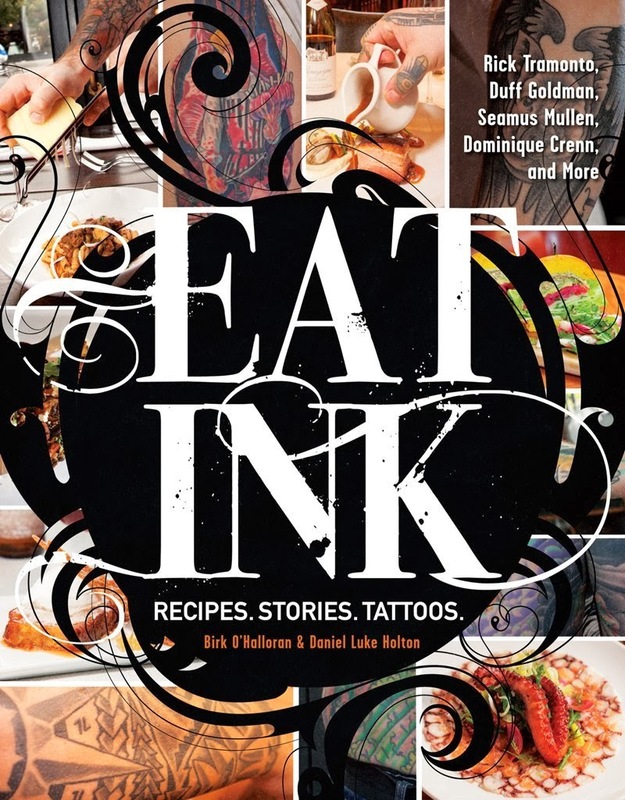 Eat Ink: Recipes. Stories. Ink. by Birk O'Halloran & Daniel Luke Holton (Adams Media, November 2013, $29.99), is a hardcover book of 304 pages, divided into five parts, including Hoofed, Finned, Winged, Rooted and Sugar. Birk O'Halloran is a sommelier and writer, as well as the owner of Iconic Wine, a Napa, California–based boutique wine company. Daniel Luke Holton's first passion is photography and is a graduate of the Art Institute of Colorado. Holton's company is DLH Creative and he lives in Denver, Colorado. Each of the five Parts contains information about a varied number of chefs, with a recipe that falls within the topic of that part. In total, about 60 chefs and recipes are included in this book. The chefs range the gamut from James Beard Award winners to prep cooks and sous chefs, and are from restaurants all across the country. Two Massachusetts chefs are included: Andy Husbands of Tremont 647 and Sister Sorel in Boston, and Alina Eisenhauer of Sweet in Worcester. You can also find chefs that were born in Massachusetts but have moved elsewhere. "You're making them smile through their stomachs. You can completely change a person's day by making them a good meal." Each section, which starts with a quote from the chef, includes 1-2 pages about the chef, their cooking philosophy and tattoos. This provides an intriguing glimpse into the mind of the chef, though it is more an appetizer than a main dish. It might have been better and more informative if these sections were longer, providing a more in-depth look at these chefs. Following each chef's section, there is a recipe, which range in difficulty from easy to complex. You'll find recipes from Black Pig Bacon and Duck Egg Carbonara to Frog Legs with Spicy Dr. Pepper Glaze, from Nasi Goreng to Corn Flake Cookies. There are soups and desserts, drinks and sandwiches, appetizers and breakfasts. There is also a Recipe Index at the end of the book which enables you to more easily find a recipe that interests you. Throughout the book, you'll find multiple photographs of the chefs, their tattoos and the dishes for each recipe. Some photos concentrate more on the tattoos while others are more scenes of the chef in their kitchen. The food shots are compelling, and the chef photos can also be intriguing, to see the type of tattoos they have chosen to acquire. Visually, it is an aesthetically pleasing book. Overall, this is a fun and fascinating book, though I would have preferred more information about each chef. It is visually appealing with plenty of intriguing recipes that will tempt your palate. A tattoo is usually a very personal thing, one which often is then displayed for all to see. To get a deeper understanding of chefs and their tattoos can be very enlightening. Check out Eat Ink. "Cooking is alchemy. I love the idea that food can be turned into gold simply by putting your soul into a dish." Many restaurants only carry one type of French fry so if you dislike that style of fry, you are out of luck. The type of French fry can vary by size, width and shape, often broken down into two rough categories: shoestring fries and thicker fries (from crinkle cuts to steak fries). I've enjoyed some excellent sandwiches at local restaurants, however, they were accompanied by fries which didn't please me, diminishing the overall dining experience to a degree. It is not enough to serve a killer burger. The accompanying French fries need to be excellent as well or you lessen the quality of that meal. And no restaurant wants to do that. I'm not a fan of shoestring fries, of those long, skinny fries which are mostly all crunch. Even worse is when those shoestrings lack the crunch and are merely limp. A single shoestring fry never seems sufficient so you commonly end up stacking a few together to eat. And doesn't that seem to defeat the purpose of making them so thin? A fry should be able to stand on its own, and not have to be consumed in a small group. Because they are thin and narrow, shoestring fries can more easily be overwhelmed by cheese or some condiment. I recently had some shoestring fries covered in cheese sauce and the poor fries were deluged, surrendering to the great glob of cheesiness. All the potato flavor was lost and it was a very disappointing dish. There must be a better alternative. And that exists in the form of the thicker French fry. The thicker shape of the fry means that the exterior picks up that delightful crunch but the interior remains fluffy and light. I think that contrast makes for a better taste, rather than the sole crunch of the shoestring. You only need a single thicker fry, with no reason to stack them together. The thicker fry can also stand up much better to cheese, gravy, condiments or other sauces. Thicker fries also can be created in various shapes with different textures, such as crinkle cut fries or waffles fries. Shoestrings basically are either long and thin, or short and thin, and that's it. That makes them boring too. Restaurants, ditch the shoestrings and opt for thicker French fries. What are your thoughts on shoestring fries? 1) Over at Nippon, there is a fascinating article, Dassai: How A Rural Sake Brewery Took On The World, which the entire Sake industry should read and heed the lessons within. The Sake industry has significant problems, with a declining number of breweries and less consumption within Japan. How does a brewery deal with those issues? This article provides the story of how Dassai has successfully dealt with those matters and plans to continue their forward progress in the future. For one, Dassai realized that many customers wanted more premium Sake, and not ordinary futsu-shu, so they decided to concentrate only on premium Sake. The current statistics in Japan for several years has shown a small increase in consumption of premium Sake, accompanied by a decline in the consumption of futsu-shu. Other breweries need to consider these statistics and work toward producing more premium Sake. Dassai also chose not to sell their Sake just locally, but to reach out to other prefectures, like Tokyo. Finally, it was important to Dassai to develop a market outside Japan, with the U.S. now being their #1 export market. Other breweries need to consider increasing their exports too, and go where the Sake market continues to increase. I strongly urge everyone interested in Sake to check out this article. 2) The Asahi Shimbun notes an upcoming and cool invention, a Sake cup that glows. A masu is a traditional Sake cup that is basically a square box of wood, usually Japanese cypress. When the masu is held at an angle, such as when you are drinking from it, the bottom of the cup will emit "a dim light in red, blue and white for about 10 seconds in each color." It sounds like an interesting novelty, and should be available in Japan in April, but it will be priced from $48-$97. At such a price, I don't think it will catch on with the general public. However, the article notes the company plans to market it to "bars, Japanese-style pubs and wedding halls." That might be a market that would be willing to pay those prices. 3) In Bloomberg Luxury, you should read an article by Aya Takada that notes how increasing Sake exports are leading to increased rice plantings to meet the growing demand. In the first 10 months of 2013, Sake exports reached a new high and the year should end as the fourth straight year of increased exports. Great news! It is also mentioned that "Prime Minister Shinzo Abe targets a fivefold increase in exports of sake, rice crackers and other products made from the grain to 60 billion yen by 2020." That gives growers even more incentive to plant more rice. The article also mentioned that the Prime Minister shared some Dassai Sake with French President Francois Hollande when he visited Tokyo in June. In addition, the Prime Minister provided some Dassai to Vladimir Putin for his 61st birthday. Will the Prime Minister share some Dassai with President Obama next? 4) Check out The Japan Times for a compelling article about the only Sake brewery in Europe, Nøgne Ø. Originally known for its beers, Nøgne Ø, has expanded into Sake production, and most recently also shochu. The brewery imports rice from Japan, and currently makes 3 different Sakes, with more in the works. All three Sakes are made in the yamahai style, which tends to provide more earthy/gamey flavors and lots of umami. I haven't had the opportunity to taste their Sake yet, but have learned that it is available in Canada, though not the U.S., which means a road trip is warranted so I can find their Sake. I love kimoto/yamahai Sake, so am especially interested in tasting their brews. 1) This January, do good and eat well by dining at some of Boston restaurants during The Greater Boston Food Bank’s (GBFB) 32nd annual Super Hunger Brunch. With a growing list of nearly 20 restaurants, diners can choose sweet and savory dishes from menus designed especially for Super Hunger Brunch weekend. Prices are set at $25, $35 and $50 per person and for every dollar spent, three nutritious meals will be provided to our neighbors in need. Participating restaurants include: 10 Center, 80 Thoreau, Blue Ginger, Craigie on Main, The Fireplace, Grill 23 & Bar, Hamersley’s Bistro, Harvest Restaurant, La Morra, L’Espalier, Michael’s Harborside, North 26 Restaurant and Bar, Post 390 Restaurant, Rialto, Stella Restaurant and Tosca. Generous in-kind donations have been provided by Cabot, Cold River Vodka, Garelick Farms, Pete and Gerry’s Organic Eggs and St-Germain Liqueur from Barcardi. For more information about the 2014 Super Hunger Brunch, gift certificates and advanced ticketing, visit http://www.gbfb.org/superhungerbrunch/. 2) On Wednesday, January 29, Boston’s Clio restaurant and chef Ken Oringer welcomse Gramercy Tavern Chef Michael Anthony, for a guest chef dinner celebrating The Gramercy Tavern Cookbook. The menu will feature favorite dishes from Gramercy Tavern, like Red Kuri Squash Soup with Lobster; Porgy with Spaghetti Squash; and Duo of Lamb, Braised and Roasted, with Broccoli; as well as highlights from Clio's menu including Foie Gras Laquée Milk & Honey, Piquillo Jam, Pickled Hon-Shimeji Mushrooms. After two decades as one of America’s most acclaimed restaurants, New York City’s Gramercy Tavern restaurant finally shares beloved recipes, stories, and its pioneering philosophy in this beautiful book, from Chef/Partner Michael Anthony. The book features a forward by Danny Meyer and 125 recipes that highlight the bounty of the farmer’s market, along with useful cooking tips and behind-the-scenes stories from the restaurant family. Cost: $135 per person, including a seven-course dinner and signed copy of The Gramercy Tavern Cookbook (not including tax, gratuity and beverages). 3) Embracing the spirit of learning in 2014, brasserie Eastern Standard gives guests an inside look at its unique, collaborative approach to staff training and culture with “Standard” Education – a day of interactive classes that recreate the restaurant’s pre-meal team teaching sessions and emphasize its above-and-beyond standards of internal education. Fresh off a week in Jerez, Spain, Bar Director Jackson Cannon leads guests on a virtual tour through the country’s primary Sherry production region with a tasting of fortified wines from various bodegas and an overview of the winemaking process. The class will also debunk common misconceptions about Sherry (grandma drink it is not! ), discuss its comeback among bartenders and drinkers alike and show how it can be integrated into cocktails. Explore the raw side of brasserie-style cuisine with Executive Chef Patrick Campbell, tasting through both classic and modern raw preparations (think oysters and tartares served alongside crudo and carpaccio). He’ll offer tips for preparing & serving raw items at home (including shopping tricks! ), showcase raw dishes beyond seafood (venison carpaccio, anyone?) and elaborate on how the raw program fits into the ES dining experience. This hands-on walk through the history of Vermouth with Beverage Programs Liaison Bob McCoy includes a discussion on the loss and rebirth of the spirit, a look at its use in classic cocktails, an overview of new artisanal production and a tasting/comparison of dry Vermouth, sweet Vermouth and Eastern Standard’s house-made rosé Vermouth. Though Southwest France is one of the country’s largest winegrowing regions, it remains largely unexplored and underappreciated by way of glass and palate. Wine Director Colleen Hein sheds light on the diverse terroir of the Sud-Ouest, tasting through both familiar and lesser-known varietals to showcase the natural spirit of the grapes grown and its vignerons. Tackle the age-old question of whether to cap off a meal with a traditional treat or a cheese course by taking a look at cheese in both sweet and savory settings. Cheese Buyer Matt Baum brings guests through the ES cheese program beginning to end, honing in on what to look for when purchasing cheese and how to form a classic cheese progression (with samples of cheeses unique to the restaurant, of course!). With interest in Scotch growing across the country, Assistant Bar Manager Naomi Levy breaks down Scotland’s native spirit by style, region and raw materials. She also dives into how Scotch has made its way into current cocktail culture, when/why people drink Scotch, how to taste spirits and proper serving techniques. Cost: $40/person per class, sold a la carte. $200 for the full day of classes. With the purchase of three or more classes, guests may also choose to add on a five-course dinner at Eastern Standard ($70 for food; $40 for optional beverage pairings) and/or an overnight stay at Hotel Commonwealth at a special rate ($169 plus taxes). Please visit http://easternstandardeducation.eventbrite.com or email dmarlette@easternstandardboston.com for package and pricing inquiries. 4) On Thursday, January 30, The Beehive, presents a special tribute to Stevie Wonder celebrating his years of soul, pop, R&B, funk and jazz hits with great cuisine, libations and live entertainment. Join The Beehive as funk-jazz band The Funky ABs take the stage to pay homage to Wonder, an American music icon. Well known for his hits like “Superstition,” “You are the Sunshine of My Life” and “Isn’t She Lovely,” Stevie Wonder has spent the past 52 years sharing his creative approach to music and writing some of the most well-known and beloved lyrics of all time. One of the most awarded male artists of all time, receiving 22 Grammy-awards, Wonder’s singing, songwriting and multi-instrumental playing, is renowned for its originality. In celebration of this musical legend’s birthday, The Funky ABs will bring their expertise of funk-jazz to The Beehive stage from 9:30PM to 1:00AM. Led by Aaron and Amy Bellamy, The Funky ABs are one of the best funk units in Boston and will surly make the birthday boy proud with their renditions of some of Stevie Wonder’s top hits. The night’s music will be complemented by the culinary contributions of Executive Chef Marc Orfaly served from 5:30PM-1:00AM. Guests are welcome for a full dinner, or to choose from The Beehive’s collection of cocktails. 5) On February 3, at 6:30pm, Legal Sea Foods in Park Square will host a wine dinner with Viña Errazuriz. This Chilean-based vineyard strives to produce the finest wines by controlling every stage of the winemaking process. With a strong emphasis on the delicate handling of the wines, the end product emanates elegance and complexity. Legal Sea Foods will team up with Commercial Director, Rodrigo Rodero, to host a four-plus-course dinner featuring signature cuisine paired with Rodero’s selections from Viña Errazuriz’s vine. Though Pliny was dismissive of rye, and there was some justification for his position, rye still possesses potential, especially in its use in whiskey. Rye is not the easiest grain to grow and it can be difficult to work with, which is why it was mainly popular in certain regions, primarily colder ones. Rye is resistant to the cold, and can survive a harsh winter much better than almost any other grain. That is part of the reason why early settlers in New England planted rye, needing a grain that could survive the cold winters. When people started making whiskey in America, they began by using a blend of grains, such as rye, corn and wheat. Whiskey with a high proportion of rye became very popular, especially in Pennsylvania and Maryland. George Washington distilled his own whiskey, which commonly was a blend of 60% rye, 35% corn, and 5% barley. However, the popularity and availability of rye whiskey nearly vanished after Prohibition. Before we get there though, let's explore a little more whiskey history. In 1869, Edmund Haynes (E.H.) Taylor Jr. bought a small distillery in Kentucky which he renamed the Old Fire Copper (OFC) Distillery. Taylor modernized the distillery, as well as instituted a number of innovations, which eventually earned him recognition as the father of the American whiskey industry. Taylor was also instrumental in helping to get passed the Bottled-In-Bond Act of 1897, which required spirits seeking this label to be the product of a single distiller at a single distillery during a single distillation season. Plus, the spirits needed to be aged in a federally bonded warehouse for at least 4 years and bottled at 100 proof. Currently, rye whiskey must be produced from a mashbill that is at least 51% rye and it must be aged in charred new oak. "Straight rye" must be aged for at least two years, and any rye aged less than 4 years requires an age statement. In recent years, rye whiskey has seen a resurgence of interest and production, and I think that is a very good thing. I like the spicy notes that rye provides to whiskey, and I know that I am far from alone in that regard. Interestingly, three classic cocktails, the Old Fashioned, Manhattan and Sazerac, called for the use of rye. After Prohibition, when rye was more difficult to find, then bartenders started using bourbon as a substitute. 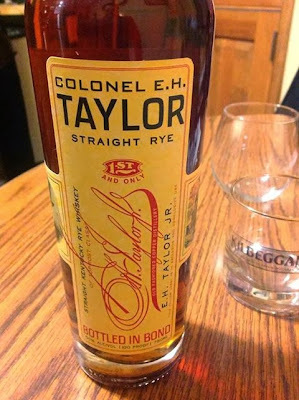 A good friend of mine, Fred Minnick, who also is a compelling whiskey writer, gifted me a bottle of Colonel E.H.Taylor, Jr. Straight Rye (pictured at the top of this post) and I recently tasted it. I was thoroughly impressed and have to say it is one of the best, if not the best, rye whiskey I have ever tasted. It earns my highest recommendation. Over 100 years ago, E.H. Taylor, Jr. was producing this style of rye and Buffalo Trace Distillery decided to honor that memory with this unique rye. The mashbill contains only rye and malted barley, omitting any corn. The rye is obtained in the U.S., which differs from many others which use rye from Europe and Canada. In addition, most ryes are produced by a single distillery in Indiana but the E.H.Taylor is distilled in Kentucky by Buffalo Trace. The E.H.Taylor is bottled-in-bond so it has been aged at least four years and is 100 proof. It also has a vintage style label and sells for around $75. I was surprised by the E.H. Taylor Rye as I was expecting something with a bold spicy profile, and instead it was far more elegant and subtle. The taste was complex, silky smooth and filled with an intriguing melange of flavors. There were delicious savory spice notes, but also some sweet vanilla and caramel, complemented with hints of mocha and dried fruit. It was seductive on my palate, and the lingering finish left me craving more. Though this Rye is 100 proof, it doesn't show in the taste so you should be careful of how much you drink as it goes down so easy. A superb sipping whiskey, I highly recommend and owe huge kudos to Fred for such a fine gift. Seafood sustainability has long been a dominant topic at the Seafood Expo North America and looking at their conference schedule for the upcoming show in March, that will continue. However, change may be coming, especially if the last Global Aquaculture Alliance's (GAA) GOAL meeting is any indication. In the current issue of Urner Barry's Reporter (Winter 2014), there is an article adapted from an analysis by John Sackton and it discusses the focus at the GOAL meeting that was held in Paris in October 2013. Seafood sustainability was not the dominant topic at this conference but rather market issues took the forefront. How can more seafood be sold to consumers? How do you handle higher seafood prices? This new focus certainly does not mean that no one cares about seafood sustainability anymore. Instead, it is a strong indication that sustainability has now become a given, that the seafood industry has generally accepted a commitment to only sell sustainable seafood. For example, it was stated that 95% of U.S. seafood is now recommended by the Monterey Bay Aquarium Seafood Watch. That is an impressive figure, and it continues to increase all the time. This is indicative that our efforts seeking sustainability have worked to a large degree, that it has become strongly entrenched in the seafood industry. The industry will continue working to make everything more sustainable, addressing the areas which have the most need for improvement. There are still problems, but they are generally being addressed. Now, the industry can move forward with another significant problem, how to sell more seafood. As I mentioned last week, annual seafood consumption has been on the decline, down to 14.6 pounds per person in 2012. The USDA Dietary Guidelines for Americans recommend that people should actually consume about 26 pounds of seafood, more than 11 pounds the current average consumption. It is clear that most Americans are not eating enough seafood so it is important for the seafood industry to find better ways to market seafood to consumers. High prices of seafood are still one of the largest obstacles for consumers, and I have addressed that matter previously too. Recent reports also seem to indicate that seafood consumption in restaurants may actually be increasing, which means consumption at home has been decreasing. People also need to learn how to better prepare seafood at home, to make it a more economical meal. They need to learn how to appreciate underutilized species, which can be just as delicious as the more popular fish. So if sustainability doesn't seem as common a topic, don't worry. It hasn't lost its importance. It has become more of a given in the seafood industry, a integral aspect that is part of the ongoing commitment of the seafood industry. And that is more reason why you should eat more seafood. Addendum: The above mentioned 95% statistic on U.S. seafood sustainability has raised some uestions. Here is a link to the Seafood Watch article on that statistic. The article states: "Of the 242 U.S. fishery species assessed by the Monterey Bay Aquarium Seafood Watch program, 95% of commercial landings have earned a “Best Choice” or “Good Alternative” recommendation as environmentally responsible seafood options." According to the Centers for Disease Control & Prevention (CDC) the leading cause of death in the U.S. is heart disease, killing nearly 600,000 people each year. What might be your best, and easiest, way of reducing your chances of heart disease by over one-third? The answer: Eat more seafood! In the latest issue of Urner Barry's Reporter (Winter 2014), there is an article by Linda Cornish, the Executive Director of the Seafood Nutrition Partnership, reiterating the sentiment that Americans need to eat more seafood for all its health benefits. Back in March 2010, I posted about the significant health benefits of seafood, and I have repeated my words a few times since then. And I am here to sound the horn once again, because it is so important an issue. As I have mentioned previously, Americans' annual seafood consumption has been on the decline, down to 14.6 pounds per person in 2012. The USDA Dietary Guidelines for Americans recommend that people should actually consume about 26 pounds of seafood, more than 11 pounds the current average consumption. The recommendation is that people should consume seafood twice a week. Do you reach that goal? Seafood is so healthy because it can contain significant amounts of Omega-3s, fatty acids including eicosapentaenoic acid (EPA) and docosahexaenoic acid (DHA). Since the 1970s, over 20,000 research studies have been conducted on the health benefits of EPA and DHA. The main conclusion is that eating seafood twice a week reduces the chances of dying from heart disease by 36%. You probably won't find another single food that has been scientifically proven to reduce heart disease so significantly. It is easy enough to eat seafood twice a week, and the health benefit is enormous. Reducing the chance of dying by the #1 killer by 36% is something everyone should desire. Unless you are allergic to seafood, then there really is little excuse not to eat it at least twice a week. Some people in the media, for the sake of garnering a greater audience, have magnified the potential dangers of seafood, ignoring the overwhelming benefits derived from seafood. These fear tactics though should not prevent you from consuming more seafood. For example, the CDC noted that from 1998-2008, there were 1451 deaths in the U.S. from foodborne illnesses. Only 94 of those deaths were attributable from seafood while 278 were from poultry, 240 from vegetables and 140 from red meat. As for the risk from mercury, PCBs and dioxins in seafood, that danger is extremely low, and far outweighed by the health benefits. See my prior article for more info on that issue. If you are considering resolutions for 2014, then endeavor to eat seafood at least twice a week. Of everything you can do for your health, it may be one of the most helpful, with proven scientific results. What's your excuse for not eating enough seafood? 1) On Saturday, January 25, from 1pm-5pm, the Wine ConneXtion, located in North Andover will host a complimentary wine tasting, “Italy Uncorked,” led by Ciro Pirone, the Director of Italian Wines for Horizon Beverage Company. Pirone will share his passion for Italian wine with tasters and reveal excellent, affordable finds from Piemonte, Tuscany, Abruzzo, Sicily and other great wine producing regions of Italy. Ciro Pirone, Director of Italian Wines for Horizon Beverage Company, knows a thing or two about Italian wines. Born and raised in Salerno, Italy, his family’s lifestyle and traditions fed his passion for wine, food and culture. As a graduate of the Istituto Alberghiero di Salerno where he studied hotel and restaurant management, Pirone landed in Boston in 1999 where he continued his wine education at Boston University, the International Sommelier Guild and the London-based Wine & Spirits Educational Trust (WSET). As the Director of Italian Wines for Horizon Beverages, his goal is to help American wine consumers better understand and appreciate the wine from his homeland. Walk-ins are welcome all day. The tasting is free to the public but please note that you must be 21 or older. 2) Join Beacon Hill Hotel & Bistro (BHHB) for the return of its Fondue Sundays featuring classic, French-style fondue. Suitable to be shared as an appetizer or to be enjoyed as a main course ($26 per pot), guests will be treated to hot French fondue featuring the distinct tastes of Domaine Giachino Abymes from the Savoie, Bergkäse Alpenblumer, Emmentaler and Gruyére Vieux. Served with rustic, locally sourced bread as well as less traditional accompaniments including small potatoes boiled in sea-salted water, cornichon pickled vegetables such as ramps, cipollini onions, and cauliflower, guests will be wondering if they are in Beacon Hill or the Alps. Just in time to escape the elements in classic mountain style, Fondue Sundays will be served every Sunday beginning Sunday, January 5 through the spring. The special will be served during dinner service, 5:30pm-10pm, in conjunction with BHHB's regular menu. Reservations are recommended by calling 617-723-7575. 3) The Seaport District and the South End will once again join the North End for the 9th Annual CityFeast on Sunday, January 26, at 6pm. CityFeast is a fun-filled evening hosted by ten restaurants in Boston: Antico Forno, Aria Trattoria, The Gallows, Lucca, Lucia, TAMO, Taranta, Temazcal, Terramia Ristorante, and Tresca. CityFeast is pleased to recognize Mayor Thomas M. Menino this year as the event Honoree for his outstanding passion and long-time commitment to supporting CityFeast, championing city-wide health and wellness initiatives and helping to promote diabetes awareness. Tickets include a five-course dinner with wine pairings (or tequila pairings at Temazcal) at the choice of the participating restaurant, and proceeds will benefit Joslin Diabetes Center’s High Hopes Fund, which supports the Center’s greatest needs in research, education and clinical care. The North End’s own Carla Agrippino Gomes established this spectacular event in 2005 to show her dedication and appreciation to Joslin after her son David was diagnosed with type 1 diabetes on his first birthday. David has received care at Joslin for 22 years. 4) On January 28, a6 6:30pm, Legal Harborside will team up with Larry McGuire, President and CEO of Far Niente, for an exclusive four-plus-course wine dinner. In the heart of California’s renowned Napa Valley wine country, Far Niente’s vineyards were established in 1885 and are internationally renowned for their ability to gracefully age with elegance and superior flavor. 5) The Bison Council, an official sponsor of the Polar Grill Fest, has teamed up with The Meat House and Redhook Brewery to serve grilling-enthusiasts bison for the first time at the third annual event. Visitors will enjoy two bison sausage flavors – Wild Rice & Asiago and Hickory Smoked – each paired with grilled peppers and onions. These sausages, along with several other cuts of bison, can be purchased at local Meat House locations in Portsmouth and York, ME, in March. The Bison Council looks forward to sharing bison’s delicious flavor with locals, while educating them on the many available cuts and often unknown nutritional facts. Many are unaware that one serving of bison (100g) has less calories than beef (103 vs. 198), fat than pork (1.35g vs. 6.48g) and cholesterol than chicken (59mg vs. 70mg). In addition to bison, Polar Grill Fest attendees will enjoy BBQ from the area’s top restaurants. All 12 participants will compete for the “Best in Snow” award, judged by Deb Weeks of Green Monkey Restaurant, Chuck McMahon, reporter for Seacoast and Portsmouth Herald and Keith Lemerise, Editor in Chief of Tasting Table. Banzai Evoluzione Sake. A Sake with an Italian name? How did that happen? Yesterday, I wrote about my visit to Chef Ming Tsai's restaurant Blue Ginger to attend a preview event showcasing the new Simply Ming "On the Road: Japan" series. The event, An Evening Celebrating the Food and Culture of Japan, was hosted by the Ministry of Agriculture, Forestry, and Fisheries of Japan (MAFF). Seven courses of food were served during the course of the evening, and Lloyd Foster of Classic Wine Imports was present, pouring a number of Sakes for the guests. Most of the Sake was imported by the Banzai Beverage Group, which was established in 2003 and is headquartered in Los Angeles. They import numerous types of Sake well as Shochu, and their website is currently under renovation. Recently, they have rebranded some of their prior products, their Sparkling Sakes, and also launched a new line of Sake, the Evoluzione series. Now, "evoluzione" is an Italian word, which means "evolution" or "growth" so why is it on a Japanese sake label? It seems that Banzai held a contest to name their new brand, and the winner was an Italian. As Evoluzione is a new brand, and the Banzai website is not yet operational, there is little detailed information to be found on it. They produce at least four different types: Junmai, Junmai Ginjo, Junmai Daiginjo and Junmai Nigori. Three of those four types are produced by the Ume No Yado brewery in Nara Prefecture while the other was produced by the Matsuyama brewery in Yamagata Prefecture. Ume No Yado also produced the Bunny Sparkling Sakes, Ume Shu and Yuzu Shu we got to taste. The Ume No Yado brewery was founded in 1893 and is located at the foot of Mount Katsuragi in Nara, often said to be the birthplace of Sake. The phrase "ume no yado" means "plum house" and refers to an ancient plum tree located on the grounds of the brewery which has been there for as long as anyone can remember. Their motto is “small volume, yet high quality” and though they tend to use many traditional brewing practices, their marketing seems more modern and innovative. Since 2002, they have been exporting their Sake, and seem to be trying to market to a U.S. audience, making their Sake labels more approachable, as well as embracing the idea of Sake cocktails. As the U.S. Sake market continues to grow, it would benefit many Sake breweries if they marketed more to the U.S. The four Evoluzione Sakes all come in blue bottles, which likely is done to protect the Sake from sunlight, which can negatively impact the taste if it is subjected to too much sun. Different colored labels are used for each Sake type, and each label also has a stylized and slightly scary Oni mask, including a skull, horns and fangs. An oni is a supernatural creature from Japanese folklore, sometimes called a demon or ogre. Though they are often malicious, there are some benevolent oni in Japanese folklore, though the oni depicted on this label doesn't look too kind. Please note that the prices are very rough estimates. The Evoluzione Junmai ($15-$20) is produced by Ume No Yado and has an alcohol content of 15%. It can be served either gently warmed or slightly chilled. This Sake seemed to have a taste of steamed rice and bitter herbs, and I wasn't a big fan of the taste. The Evoluzione Junmai Ginjo ($15-$20) was much more my preference. It was produced by the Matsuyama Shuzo, has an alcohol content of 14%, and is best served slightly chilled. It had a smooth and pleasing taste, with delicious flavors of pear and melon. Easy drinking, but with plenty of flavor. The Evoluzione Junmai Daiginjo ($50-$60) is produced by Ume No Yado and has an alcohol content of 15%. It is an elegant Sake, with a nice melange of subtle fruit and herbal notes. It has the lightest body of the three, but also the most complexity. An impressive Sake. Finally, the Evoluzione Junmai Nigori is produced by Ume No Yado and has an alcohol content of 14%. More full bodied, it only possesses a mild sweetness and delicious tropical fruit flavors, including prominent coconut. I am not a fan of overly sweet Nigori, so this was a pleasure to drink. Ume No Yado also produces an Aragoshi line, Sake-based liqueurs, including Ume Shu and Yuzu Shu. Each contains Sake, 21% of fruit by volume, and a tiny bit of Shochu for depth and aroma. The Ume Yuzu possesses a bright citrus flavor, a bit of tartness and a mild sweetness. Very pleasant and would make an excellent cocktail addition. The Ume Shu is sweeter, with a prominent ripe plum flavor, and it too could be used in a cocktail. Though useful in a cocktail, I am sure plenty of people could drink these on their own too. The Banzai Bunny Sparkling Sakes are produced by Ume No Yado and were rebranded from their former names such as Moon Rabbit and Star Rabbit. They come in four flavors: Natural, Blueberry, White Peach & Yuzu. In general, each is fruity, lightly effervescent and mildly sweet. I have previously reviewed them under their original names, and they make a nice introduction to Sake for a newcomer. I have poured Sparkling Sakes at numerous tasting, and they are a big hit, especially with women. They might not taste much like Sake, but they can show people the diversity and versatility of Sake. The evening also included two Tyku Sakes: their Black, a Junmai Ginjo, and White, a Junmai Daiginjo. The Black is produced by Ume No Yado and the White is made by the Matsuyama Shuzo. "The worst cuisine is bad fusion." Last month, I visited Chef Tsai's restaurant Blue Ginger, located in Wellesley, to attend a special preview event showcasing the new Simply Ming "On the Road: Japan" series, part of Season 11 of this popular PBS show, shown locally on WGBH. The event, An Evening Celebrating the Food and Culture of Japan, was hosted by the Ministry of Agriculture, Forestry, and Fisheries of Japan (MAFF), which also sent Chef Tsai to Japan to explore its diverse and fascinating food and beverage industry. This was a fun, interesting and informative event with plenty of delicious Sake and food. It also was a strong motivation to watch the new Simply Ming episodes. During his whirlwind tour of Japan, Chef Tsai visited the prefectures of Osaka, Hyogo, Nara, Nagoya, and Tokyo. His visits spanned from how specific food items are produced, such as miso and Sake, to how foods are sold, such as seafood at the Tsukiji Market. In addition, he got to learn how Japanese cuisine is prepared, cooking with some of the top chefs of Japan. When Chef Tsai spoke about his wonderful experiences in Japan, his passion was infectious. Those experiences have been recorded in six episodes, three of which have already aired. The first episode, Michiba & Seafood, was all about seafood, including a visit to Tsukiji Market. Chef Tsai also had the opportunity to cook with Japan’s first Iron Chef, Rokusaburo Michiba. Though Chef Tsai rarely gets nervous, he felt nervous while cooking with this culinary legend. The second episode, Wakiya & Ramen, is all about ramen, including a visit to the Instant Ramen Museum in Osaka. Chef Tsai cooked with another Iron Chef, Chef Yuji Wakiya, using the famed Kobe Beef A5 in his own dish. The third episode, Street Foods in Japan, is self explanatory, as Chef Tsai checked out the diversity available, from yakitori to takoyaki. The final three episodes will start airing next month: February 15, February 22 and March 1. Set your DVR accordingly. Over the course of the evening, servers came by with seven different dishes, each compelling and satisfying. Above, you can see the Foie Gras Shumai, in a sauternes-shallot broth. Other dishes included the Smashed Shrimp Dumpling, with a citrus-truffle vinaigrette, Sake-Miso Marinated Sablefish, with vegetarian soba noodle sushi, wasabi oil, and soy-lime syrup, and Thai Style Chawan Mushi, with lobster and mushrooms. I didn't have a single complaint about any of these dishes, and would definitely order any of them if I saw them on a menu. The Chawan Mushi was one of the best I have ever tasted and every dish burst with flavor. One commonality with all these dishes was the taste of umami, which made them especially delicious paired with Sake (and I'll be posting about the Sakes tomorrow). Two of the dishes are presented in the On the Road series, including the Miso-Sake "Coq au Vin" and New Style Buri Sashimi with Hot Curry Oil. In the Coq au Vin, the Sake and miso were both sourced from producers in Nara and Nagoya. This dish was a burst of umami, with such a rich and flavorful broth and tender chicken. The Buri, also known as yellow tail, was sourced from Japanese waters at the height of the season. Such fresh and silky smooth fish, complemented by the spice of the oil and hints of sweetness. It may seem to be a relatively simple dish but it possessed a complex melange of flavors. Though Chef Tsai didn't really explore dessert options while he was in Japan, he did prepare a dessert for us. The Toasted Sesame Pear Tea Cake, with miso-caramel and sweet cream, was an excellent way to end the evening, presenting a balanced sweet with a nice combination of textures. I had sufficient room to eat two of these tea cakes. In the later part of the evening, Chef Tsai spoke a bit about his recent experiences in Japan, as well as discussed some of his cooking philosophy. He ended his discussion by taking numerous questions from the attendees. With the amount of questions from the audience, Chef Tsai could have probably spoken for about four hours. Chef Tsai is insightful, charismatic and humorous, and certainly enthralled the attendees with his tales of the culinary world in Japan. As he began, he explained that Japanese cuisine is one of his favorites in the entire world, noting that the "food is so pristine," and that included their Sake as well. The purity of Japanese cuisine is an important aspect, and that desire for purity permeates much of their culture too. The freshness and quality of their ingredients is an essential component, and they understand that if you possess such a high quality ingredient, little needs to be done to prepare it. It largely can stand on its own, bringing a wealth of flavor. In addition, when referring to an exquisite Sake, the Japanese may state that it is "as easy to drink as water," referring to the purity of that Sake. Chef Tsai waxed longingly about his recent experiences in Japan, reveling in all the wonderful things he had to eat, from sublime Kobe 85, which he equated to "eating a nugget of fat lined with meat" to a Wakiya ramen with crab and an intriguing soy cream. He spoke reverently about the famous chefs he visited, being allowed to cook beside them. As we watched some clips from the new shows, it was evident this is going to be a fascinating view into Japan cuisine. Chef Tsai even was surprised in Japan when he stopped at a truck stop and found it contained a large and well stocked food market, with an assortment of fantastic ingredients. You probably won't find something like that in any truck stop in the U.S. Instead, you are more likely to find Slim Jims and Doritos. Besides relating his Japanese experiences, Chef Tsai also talked more generally about Japanese cuisine, and the challenges in bringing it to the U.S. When Chef Tsai first learned how to make sushi rice, he wasn't allowed into the sushi preparation area for the first three months. He had to earn the respect before being able to enter that area. Another very Japanese concept. I started this post with a quote from Chef Tsai about bad fusion, and he went into greater detail about this thought, tying it into the greater issue of respect. Like Chef Tsai, many chefs now prepare an East/West cuisine, though it might be known by other terms, such as New French or New Spanish. Despite those other terms, the basic idea is the added use of Eastern ingredients to more traditional Western dishes. Chefs now have a ready availability to a deluge of ingredients from all over the world. That is a fantastic opportunity but can also be a trap, especially if you do not truly understand those ingredients. Chef Tsai believes you need to respect those ingredients, and that requires learning about them, understanding how they are used in their native land. He feels you need to "earn the right to blend," and not just toss ingredients together when you really don't understand their origins. Any chef can mix numerous exotic ingredients together on a plate, but that doesn't mean the dish will work or taste good. Careful preparation requires knowledge and experience. He also added that "more is not better" and that simpler dishes are usually better. You can tire a palate with too many complex dishes with lots of ingredients. That is why many Japanese dishes lean more toward simplicity, yet still do not lack for flavor. The key is often using the best ingredients, letting them largely stand on their own. For example, sushi is often a simple dish, and its quality depends in large part on the freshness of the ingredients, such as the seafood. Chef Tsai noted that "we create dishes to make a better dish not a different dish." That concept should govern chefs when designing a new dish. If you can travel to a place like Japan to learn about their ingredients and cooking styles, that would obviously be the most educational. For example, in Osaka, there are about 120 different types of restaurants! Such amazing specialization. However, the Internet is an invaluable tool now for researching ingredients and cuisines if you are unable to travel to the source. Or, you could also seek out a chef in the U.S. who is conversant in the cuisine. Chef Tsai noted that New York City has a number of great, authentic Japanese restaurants. I recommend that you check out the Simply Ming "On the Road: Japan" series, and learn more about the fascinating world of Japanese cuisine. And I also recommend that you check out Chef Ming Tsais's two restaurants, Blue Ginger and Blue Dragon. And hopefully chefs and cooks will take heed to, and seek more knowledge about exotic ingredients before using them in their kitchens.